Early in the second round of the UFC’s December 13h lightweight bout in Phoenix, Garett Whiteley scored an elbow from his back, opening up a cut under David Michaud’s right eyebrow. Immediately, blood began spraying all over the canvas. While Michaud and Whitely took a breather, while the fans talked and the corners fretted, cutman Mike Afanasiev went to work. First he cleaned Michaud off. Then he dipped a cotton swab in epinephrine, and applied direct pressure to the cut. Just before the bell for the third round ran, Mike rubbed a vaseline paste over Michaud’s eye and stepped back. The cut didn’t open up during the third round and the conversation switched back to Whiteley’s lack of firepower and Michaud’s inability to score big off of his two takedowns in the round. Michaud went on to win a unanimous decision. No one mentioned the cutman, but his influence on the outcome of the fight was huge. Mike Afanasiev is a former amateur wrestler and boxer from the Bay Area who trained under former AKA coach Lynn Shutz, occasionally working out alongside Javier Mendez in Scott Coker’s old Ernie Reyes Taekwondo studio. After a short career as a fighter, Afanasiev wandered into a career as a fireman, starting out fighting the seasonal forest fires that plague California in the summer, and then moving on to become a full-time fireman and paramedic for the Cook County Fire Department in Las Vegas. He now splits time between his jobs as a fireman and as a cutman for the UFC and for various regional MMA and boxing promotions. Afanasiev spent six weeks as a cutman in China during the TUF: China show, and just recently returned from Barueri, Brazil, where he worked the Machida - Dolloway card. But before the trips around the world, he had to learn the wraps. Boxing coach Jeff Mayweather put Afanasiev in touch with Jacob “Stitch” Duran, one of the few recognizable names in the cutman business, and Duran said: go spend time in the trenches, learn your trade. Treating cuts is also an art. Cutmen have 45 seconds at most to work on cuts, and that’s where technique and experience play a large role. Knowledge of the the effect drugs and vaseline also helps. The most common drug used to help close cuts is epinephrine aka adrenaline. Adrenaline is a helluva drug: “As a hormone and neurotransmitter, epinephrine acts on nearly all body tissues”—a natural dose triggers the body’s fight or flight response, constricting blood vessels, opening up the lungs, and forcing blood out of the extremities to the core. Just 1cc of epinephrine can help bring a patient back from a cardiac arrest. A cutman uses a minute amount of epinephrine, coated on a cotton swab, to constrict the blood vessels in a cut. The effect, known as a localized vasal constriction response, is a quick and efficient way to stem bleeding and close a cut. Mike also applies a coating of iced vaseline to the cut, which acts as a paste or “temporary scab”. There are two other drugs that can be used to stop bleeding and close up a cut, avatine and thrombin, but Mike has only ever seen avatine in action. Cutmen stand in a very unique spot, between the fighter and the doctor, between keeping a fighter safe and allowing him or her to keep going. 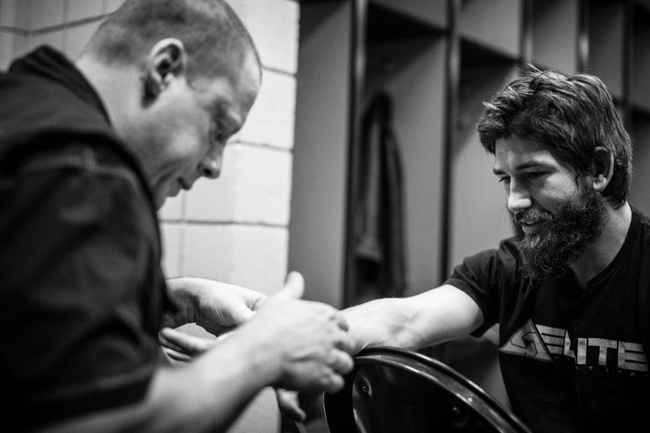 The decision to call a fight ultimately lies with the doctor, and a cutman actually replaces a coach or cornerman between rounds in the octagon, so the loyalty of the average cutman veers slightly toward the fighter. Swayze and Mike both have stories from the past - cuts they closed, cuts they couldn’t close, swelling that never went down and wraps that had fighters coming back to them after the fight and saying thank you. 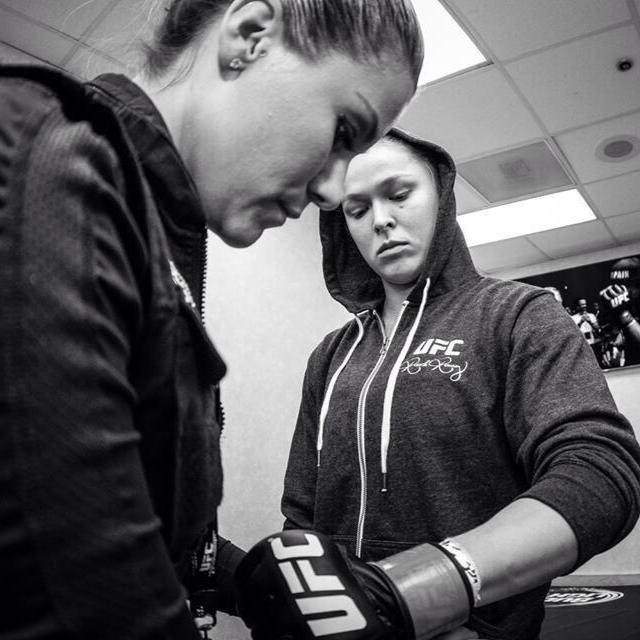 Swayze worked Leslie Smith’s corner during UFC Fight Night Mexico City on November 14, 2014. Jessica Eye hit Smith right in the ear and it exploded on impact. Swayze treated the ear and had the bleeding stopped for round two, but after several more strikes, Leslie’s ear split in two. 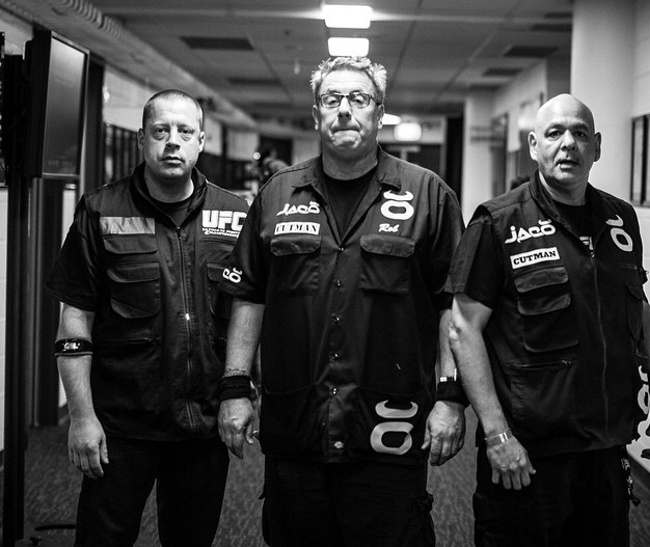 For Mike, even after so many years working as a fireman and a cutman, it’s one of the more recent fights that he remembers when I ask him to tell me about an extraordinary fight he has had to deal with. “The David Michaud fight really sticks out for me,” Mike said. “If you look at round two and round three, here is a huge difference. He was basically a bloody mess - it’s like someone turned on a sprinkler—and then in the third round, he’s clean. I gave him an opportunity to stay in that fight. It was one of those moments when you say to yourself, ‘Hey, this is why we’re here’”.